Hail, faithful citizens of Jimlandia! We’ve got a trio of news items for you today. 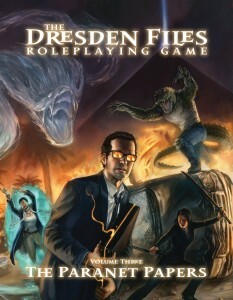 Evil Hat Productions’ Dresden Files RPG supplement, The Paranet Papers, is in preorder now! If you preorder the book today, you’ll get the PDF as a free extra right away (as soon as your payment clears). Better yet, if you’d prefer to support your local game store by preordering the book from them, the same offer exists! Point your FLGS of choice at this run-down of how to make it happen — or keep your receipt from the preorder and contact Evil Hat to get the PDF direct from them. The PDF is only available as part of a preorder of the physical book right now. Evil Hat says they’ll release the PDF as a stand-alone product closer to the book’s shipping date in June. 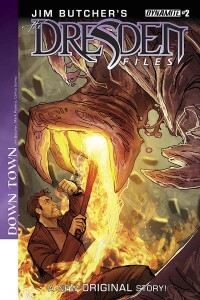 Harry and Molly’s battle against sorcerer and slime continues today with the second issue of Down Town, an original comic story from Jim Butcher & Mark Powers. Something large, ruthless and possessed of supernatural power is smashing its way through Chicago-not to mention some of its residents. Harry and Molly are desperate to end its trail of destruction, but first they need to figure out what the blasted thing is. Further complicating matters is the involvement of “Gentleman” Johnny Marcone, the city’s most powerful mob boss and recent signatory of the Unseelie Accords. Marcone is determined to find the creature, too—and if he has to go through Harry, so be it. Read the details and catch a preview of the first few pages over at Dynamite’s site. We have a tentative itinerary for Jim’s first trip to the UK (and a little bit of elsewhere). 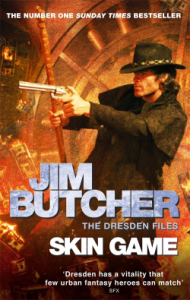 Jim will be appearing, along with Seanan Mcguire and other guests of honor, at Eastercon 2015 from April 3rd to April 6th. Learn more details over at the Dysprosium/Eastercon 2015 website! For up-to-date information about his appearance at bookstores in the UK, please check out this post on Orbit, covering appearances at Forbidden Planet London, Waterstones Deansgate Manchester, and Waterstones Liverpool One from April 7th to the 9th. Other dates or adjustments may show up on the schedule, so make sure to sign up for updates over at Orbit if you’re looking to catch Jim while he’s there. We also hear he’ll be flying over to Sweden afterwards, making appearances at SF Bokhandeln in Stockholm on April 11th, and SF Bokhandeln in Gothenburg on the 12th. Both should be evening-ish appearances, but you’ll need to contact the bookstores themselves to get confirmation of the schedule at this time. That’s it for today — we’ll update you when we learn more. Long live Jimlandia! io9, New Signings, and Bigfoot Collection Marsters’ Ghost Story coming at last!